In 1993, the Defense Advance Research Projects Agency (DARPA) initiated a program to develop biomedical technologies for use on the front line of the battlefield in 1993. Research had shown that even though medical care has greatly improved during the last three decades, the number of casualties on the battlefield has essentially remained constant. The focus of the Advanced Biomedical Technologies Program (ABMT) was to apply techniques in robotics, virtual reality, three-dimensional visualization, telesurgery, microelectromechanical systems (MEMS), informatics and multi-media simulation to producing products for the care of wounded personnel on the front lines of war. Achievements were made in each of the projects three major research areas: diagnostics, therapeutics, and education and training. 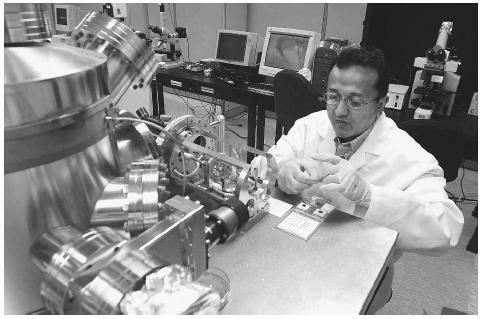 A Purdue University professor demonstrates an atomic force microscope, used to view biochips, a technology aimed at making diagnostic devices that can be used to quickly analyze samples with high sensitivity. the fabric that monitor and transmit vital signs and location to medics in real-time. ABMT has also developed hand-held sensors for taking ultrasounds, measuring blood gases and body chemistry, and producing digital pathology reports in the field. ABMT has also developed new therapeutic technologies for use on the front lines. The Life Support for Trauma and Transport (LSAT) unit is a commercially available stretcher that performs all of the functions of a portable intensive care unit. Medics evacuate wounded soldiers to LSAT units where they can administer IV fluids, intubate and ventilate lungs, and medicate and monitor the soldier until they reach a hospital unit. In addition, ABMT developed several systems for performing telesurgery in remote locations using telemedicine, robotics, and miniaturization. The final focus of AMBT was to develop novel educational and training tools for troops. Virtual reality (VR) programs simulate battlefield situations and give soldiers first-hand experience for assessing the status of a wounded soldier and deciding on the best way to diagnose, treat, and evacuate the injured individual. Multi-media simulations teach an array of surgical and medical techniques focusing on the procedures that medics are most likely to encounter on the front lines of the battlefield. Defense Advanced Research Projects Agency, Defense Sciences Office "Advanced Biomedical Technologies" < http://www.darpa.mil/dso/trans/abt.htm > (March 24,2003).